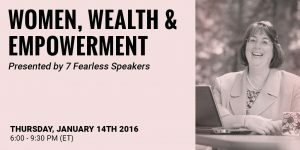 Home » For Women	» To Retire Successfully, Become Financially Fearless! I was one of “The Fearless 7” women who presented during a live web event. Helping women take charge of their financial picture is at the top of my to-do list! Helping women get more engaged in planning for the financial realities of retirement is something near and dear to my heart…and to several other advocates in the financial industry. I was honored to be invited to participate in an all-female, live webcast in mid-January with six other champions for women’s financial wellness. Here’s the brief background: Sandy Chaikin has an interesting backstory about her financial journey –from having money, to losing a large chunk of her assets, to owning her investments. (You’ll have to wait till the March blog to read all about it!) As a result of her rude financial awakening, she founded a company that makes investing more approachable and time efficient for women. Of course, men will find Chaikin Analytics great as well. It was Sandy’s idea to get a number of women “champions” together to present a live web event. Hundreds of women and some men joined us on January 14th for a three-and-a-half hour event that featured “the Fearless Seven”. Each of the presenters offered unique stories for why they are so unwavering about getting women in the game of finance for their own well-being and benefit; each person is passionate about helping women avoid some of the common mistakes we’ve all made. But don’t wait too long. Getting started on your personal financial future can’t wait another day! Sandy Chaikin, Chaikin Analytics lead us off. She started with a bold question: “What’s holding you back?” We’re all “time poor”, but women, especially, must get involved in their financial investments and become more financially fearless. After you take the time to learn how to be an investor, you can track your investments in as little as 15 minutes a day. Pegi Burdick, The Financial Whisperer. Her premise is that much of your perspective and relationship about money comes from your childhood. However we have many other abilities that help us overcome any baggage from those early years. We just need to acknowledge and tap into those abilities. Tina Powell, SheCapital. Women have a finite amount of time and energy, so you need to find solutions that let your money work harder when you can’t stay on top of every detail. She shared with us that she isn’t doing anything “magical”, but everyone gets better by doing the same thing day in and day out. Emily Boothroyd, CFP®, Senior Wealth Advisor. Out of the gate, Emily acknowledged that most of us are afraid of losing our money. That’s normal and okay. Becoming bolder than needed moves us into too much investment risk, and there is no need to go to the extremes. Be bold when it comes to asking questions. Once you ask the first question, others feel they too have permission to ask their questions. Zenilia Harris, CFP® and president of Harris & Harris Wealth Management Group is the author of Finance ‘n Stilettos, Money Matters for the Well-Heeled Woman. She recognizes the financial decision-making power that women have. She believes women can become comfortable investing in brands we love and stores we shop in. Don’t underestimate the brands you love! From yours truly – I shared several key questions from my book, What’s the Deal with…Retirement Planning for Women?. These are questions that push each woman to ask herself honestly what she needs before she retires – and to find her own answers. The goal of this particular webcast served multiple purposes. We invited women of all ages and at all stages of investing knowledge to hear from some of the strong, intelligent and passionate advocates out there who have made financial mistakes and learned from them. We focused on sharing our experiences to take control of our finances. We wanted women to know that they are not alone in some of their feelings of financial inadequacy; but, that these feelings are not an excuse for avoiding building your investing and finance education. And, most important, we wanted to impart some words of wisdom to help build financial confidence for all participants in the web event. Women who walk in stilettos walk with confidence. The financial advisor you choose should respect your values (and don’t settle for anything less). Don’t be too embarrassed to ask for help or ask tons of questions. 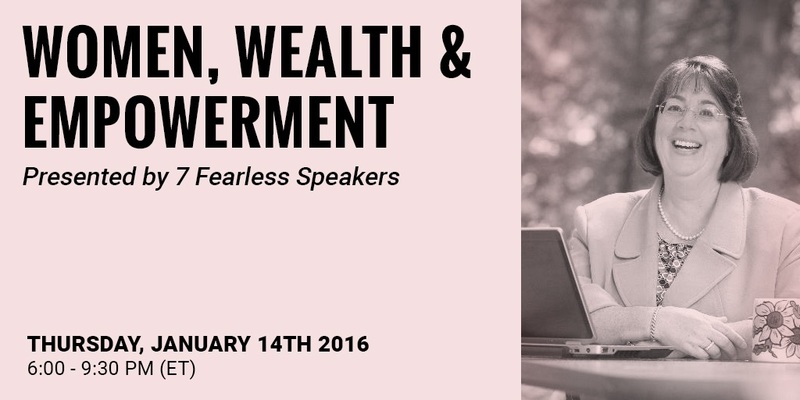 Regardless of your age or your comfort with financial topics or even your upbringing, you can become financially fearless! Start by listening to the webcast and then follow up on some of the terrific information you’ll hear from the “Fearless 7”! « California or New Orleans – How To Decide Where to Live in Retirement?